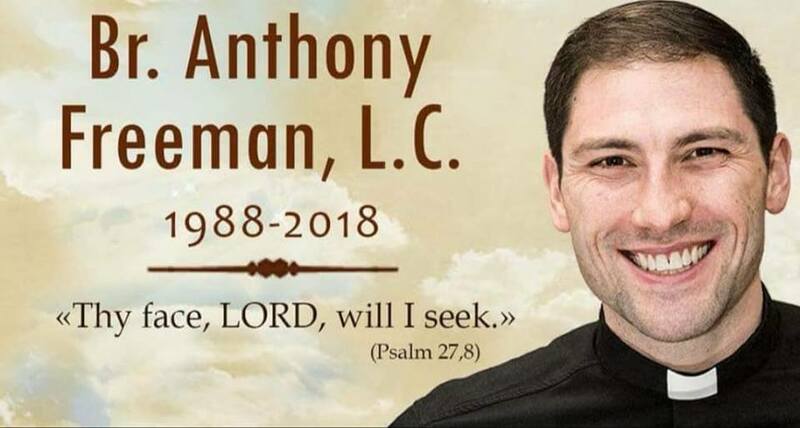 Legionaries of Christ Brother Anthony Freeman died in his sleep from natural causes. The Legionary of Christ Brother Anthony was from Houston. He was a US seminarian, who was a third-year theology student at Rome’s Pontifical Regina Apostolorum University. He was only 29 years old. Brother Anthony was scheduled to be ordained a deacon July 7 in Houston. He was found dead in his room April 2 after classmates wondered why he had not joined them for a scheduled outing.On April 1 he served as an acolyte for Pope Francis’ Easter morning Mass, carrying the cross in the opening procession. “They usually pick the tallest person” to carry the cross to give it prominence, and “he was tall and strong and to bear the cross was very symbolic” in hindsight, Legionary Father Aaron Smith told Catholic News Service on April 4. Anthony was born in Houma, Louisiana, in 1988 to Brian and Debbie Freeman, Brother Freeman studied at Legionary institutes in Center Harbor, New Hampshire; Colfax, California; Cheshire, Connecticut; and Thornwood, New York. He started studying in Rome in 2013 and received the ministry of acolyte in 2017. He was very active on social media and email to connect people with Christ. He managed a “Catholic Life Coach” page on Facebook and had more than 11,000 followers on his Instagram account, @catholic_life_coach. His website was called branthonyfreeman.com —He just published an inspirational book, “One Step Closer: 40 Doses of Motivation, Hacks and Experiences to Share with Millennial Catholics,” published in January 2018. February’s featured guy for “Why I Love Being Catholic” is Br. Anthony Freeman. I started following Anthony on Instagram and one of the first things I saw was a video of him at night in the streets of Rome with some other seminarians. A couple of the guys were playing guitars and there was a crowd and dancing. It looked magical. What struck me was that Anthony and the other seminarians were radiant. Their smiles were so genuine and joy-filled. Br. Anthony is studying to be a priest in Rome, though he is from the U.S. He calls himself a Texas/Lousiana hybrid. I see his frequent posts of him roaming around Rome or the Holy Land and, basically, I try to live vicariously through him. Lol! Br. Anthony has just finished writing a book called “One Step Closer.” It just came out, so I haven’t had a chance to read it yet, but I’m looking forward to cracking it open. It’s a “modern, mini handbook for Millennial Christians” trying to live out their faith in this world. I have a feeling, though, that it’s not just for Millennials. I can tell that Br. Anthony is truly making the effort to live out his call to holiness and I know his book will be a helpful guide. Check him out on Facebook @catholiccoach and at Instagram at @catholic_life_coach. You can also check out his website at www.branthonyfreeman.com. Here are his answers on why he loves being Catholic all the way from the eternal city! 1. Are you a cradle Catholic or convert? If a convert, what did you convert from? I am a cradle Catholic but have come to terms that I will always have a little atheist, a little heathen, a little Protestant inside of me. This keeps me on my toes in my faith. Cradle Catholic shouldn’t mean comfortable Catholic. I do come from a solid Catholic family though! 2. Who is your favorite saint and why? St. Joseph hands down! There is something about Joseph’s closeness to Jesus and Mary as well as his simplicity and silence that really attracts me. Besides, he worked with his hands. However, when Venerable Fulton Sheen becomes a Saint he will supply a lot of competition to St. Joseph on my list. Fulton Sheen is one of my heroes in how dedicated he was to his mission and his ability to communicate the good news of Christ. 3. What is the best Catholic place you’ve visited? Where do you hope to visit? This is a hard one. I am torn between the eternal city of Rome and the small cave of Bethlehem. I have spent five years of my seminary formation in Rome being close to the Pope, learning from the experience of this city that has seen everything from the great saints to heretics and breathing in the universality of the Church just by crossing St. Peter’s square. I hope to do the Camino de Santiago one day. Maybe after I am a priest. That way I can celebrate mass during my journey! 4. What’s a myth or misconception that you hear about the Catholic faith? What’s the truth of it? A myth of the Catholic faith is that WE Catholics many times don’t see that we are all called to holiness and evangelization. The myth is that we believe that being a good person is good enough when really our happiness as persons lies in becoming holy and fulfilling the life purpose God has created us for. 5. Besides receiving the Eucharist, what’s your favorite part of the Mass? From my perspective the Collection…just kidding. Besides the Eucharist, my favorite part of the Mass is the singing. In Philosophy, we talk a lot about how God is complete goodness, truth, and beauty. Beautiful liturgical singing is something that touches me profoundly. 6. Why do you love being Catholic? It’s home. Being Catholic challenges me to be better yet understands and heals my weaknesses. It gives me a vision and ideal for my life and the means to achieve it. But in the end, I love being Catholic because it means belonging to the Body of Christ!